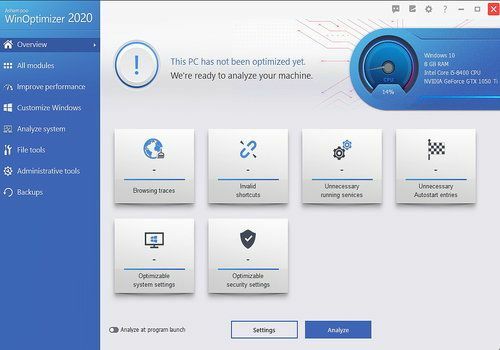 Ashampoo WinOptimizer is the ideal tool for anyone who wants to optimize the operation of their computer. Indeed, with software installations and uninstallations, your machine can slow down and the slightest task can become tedious. Software like WinOptimizer allows you to fix the problem and make your computer as fast as it was on the first day. For example, it has a feature that allows you to clean your PC with a single click. Ashampoo WinOptimizer is also able to alert you when your system fails. Players will be able to take advantage of a tool called Game Booster that frees up all the computer's resources for use during a game. The software is available in a trial version to test all the features. In its latest version, Ashampoo WinOptimizer also offers privacy modules that disable Microsoft's data collection tools. The program is also able to provide you with complete information about the software installed on your computer and the hardware that makes it up. Faster backups and backups. Recovery of space on file servers, storage systems and reduction of data transfer and storage costs.